My mantel is like this for today. Not sure about tomorrow, I just might nest some more. And isn’t that what is so lovely about spring? Every day something new and pretty unfolds. 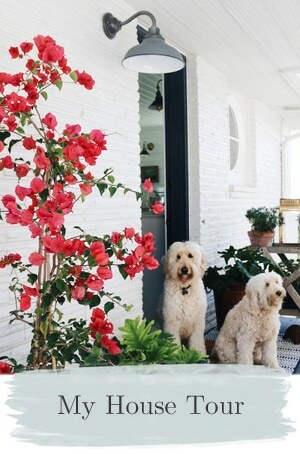 Is your home looking like spring? Here is another of my spring mantels! 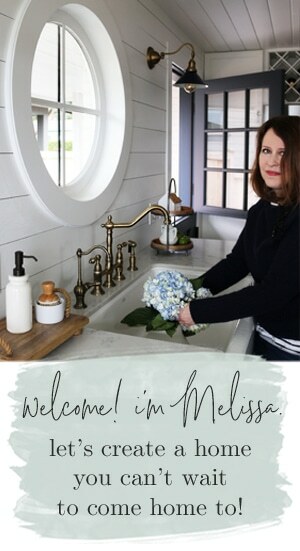 Beautifully written, beautiful photos, bless you Melissa. Thank you Kate for your sweet and encouraging comment! Love it! Spring hasn’t arrived where we are just yet, but this has motivated me to start thinking in that direction! So pretty. I’m in spring cleaning mode, closets specifically. I will get around to the decorating part soon, though! 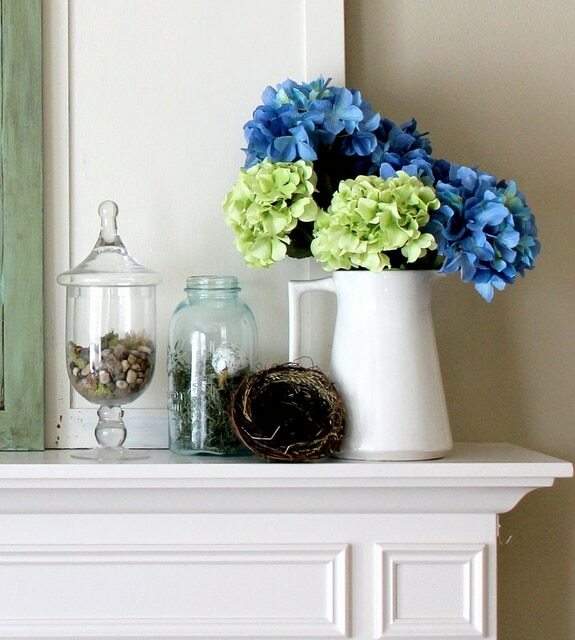 The pops of blue on your mantle look cheerful and perfect for Spring! 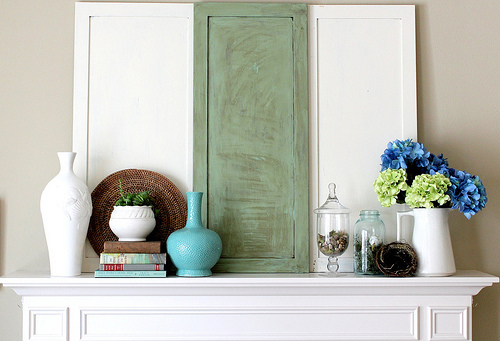 It’s getting there…love the greens and blues on your mantel! Haaa. You are PREPARED in advance. Love that. I put nests in my Christmas tree. My husband takes them and sprays them with acrylic so the pieces stay together. Just check for mites before bringing them inside the first time. your mantel is beautiful and your PHOTOS! Perfect lighting. this is so fresh, clean and pretty to view…the colour and the composition. 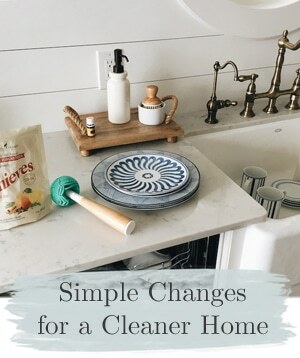 And yes, our decor in spring can change on a dime, because as you said, things change so quickly as the season unfolds…there is always something new. What a happy mantel…what a happy season of HOPE! 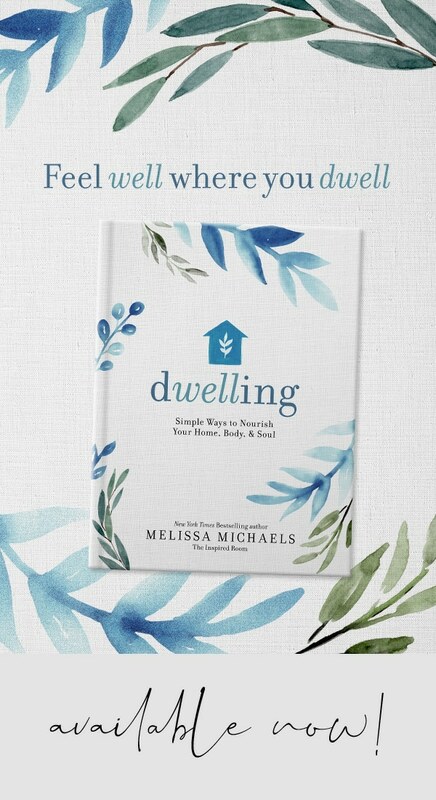 I pray you have a wonderfully blessed day nesting and making your home today, Melissa! Beautiful season ~ beautiful mantel ~ beautiful photos! LOVE the way you choose books with bindings in colors you want to bring out. 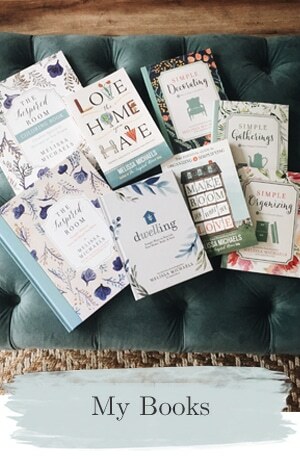 I would NEVER have thought of that- copied you for my fall mantle with the books… now I cant’ wait to see what ones I could use for my spring mantle! :) We still have snow here, though… so it’ll be a few more weeks for me! Thank you, I always seem to find a way to use books in every season! Every spring day is different for me. On the cold Spring days I like to stay in and snuggle down, on warm days I like to work out in the garden or open all the windows and fluff the house. So many options! Your mantle looks beautiful! I love all the light you have coming in your room and the white is so lovely! I’m having a Heart of the Home Party – Show Us Your Favorite Cupboard on April 5th. I would love it if you could come. Just lovely! And I love the turquoise vase. 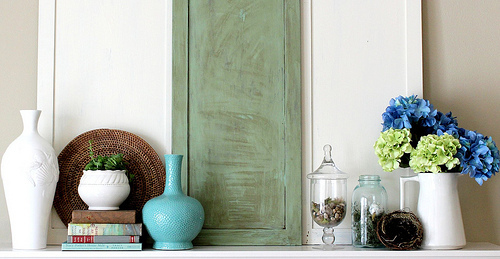 I have a pop of turquoise on my mantle right now, but I need something springy…maybe a little vase of flowers. 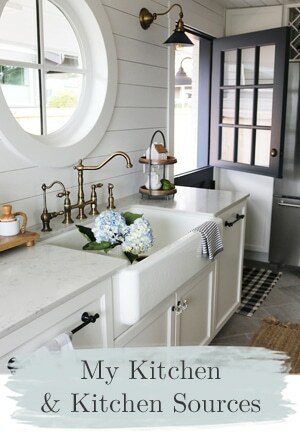 Gorgeous mantel Meliisa..love the photos! So funny…the left side of your mantel looks so much like mine…I have the same round seagrass mat (from Ikea) and used it exactly as you did…I must be doing something right!! Very Pretty- love the pop of blue. I love hydrangeas – I made my wedding bouquet from them last year! And, I already have a couple of blue vintage ball years. Hmm, I feel a little decorating coming on! I’m starting to “spring-ify” my space. 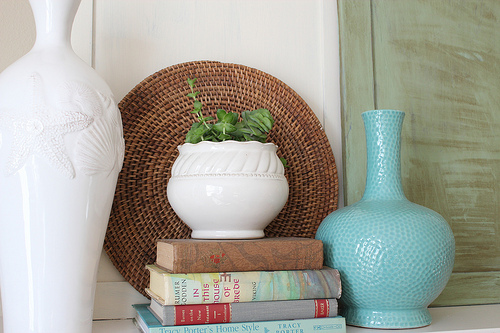 I love the mantle – my favorite detail is the book with the red stripes, how nicely that goes with the turquoise vase. Just a lovely little touch. 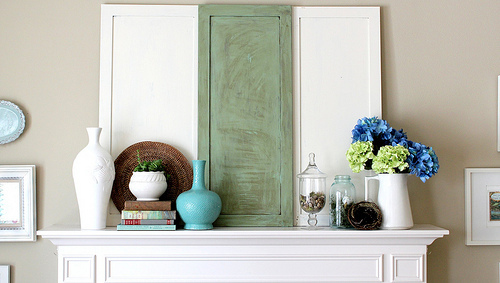 Your spring mantel is so refreshing. It must set the stage for a peaceful room in which to read and relax. You never miss a detail….like the 2nd and 4th books in their sweet blues to pick up the blues in the flowers and vase. uh, the link keeps bringing me back to you, is that supposed to happen? Ahhh, no. I messed it up. Just fixed it! Thank you for letting me know! Eek. So pretty! I especially love the stack of books! just LOVELY. so fresh. maybe NEXT week I’ll have/make the time to fluff/nest our home. thank you for the inspration, Melissa! as always! Your mantel is just gorgeous! I’m in mental spring mode, but have not nested to reflect that just yet (might have something to do with the snow we got less than a week ago!). We’re hosting Easter dinner this year, so the shopping list for table decorations, a wreath for the door, and all sorts of decorations just keeps growing. Thanks to you, our mantel has been added to the list! I absolutely ADORE IT!!!! Thanks for the inspiration! Lovin’ the freshness of the look and I love that you might not be done yet! That’s the fun of decor, I think. Thanks for sharing, Melissa! I love your blog so much I’ve added your button to my blog. I also love your new house! I love it all. It looks very light and airy. Such inspiration. I just stopped by from TCB’s Get Your Craft On. The mantel looks incredible. And no, my home is not yet ready for spring. But I am. Love the calming choice of colors of the accessories and flowers. Love your fluffing and moving stuff around. Exactly what I did to create my mantel for Spring. Collecting tips, Spring seems like it’s coming soon!